You may be surprised to know that the Low FODMAP Diet is not a dairy free diet. It gets confusing because there are some dairy products that are suitable for the Low FODMAP Diet and there are some that aren’t. ​Lactose is the natural carbohydrate, or sugar molecule, present in cow’s milk, and is high FODMAP. Since some dairy products, like cheese and butter only contain trace amounts of carbohydrates, they are considered naturally low FODMAP. Milk, yoghurt, cream and ice-cream can be made lactose free, and therefore low FODMAP, by adding lactase, an enzyme that separates the lactose into glucose and galactose. Lactose is the natural carbohydrate, or sugar molecule, present in cow’s milk, and is high FODMAP. Since some dairy products, like cheese and butter only contain trace amounts of carbohydrates, they are considered naturally low FODMAP. Traditional Greek yoghurt that is strained is also naturally low FODMAP. The straining process removes most of its whey (which is also where the lactose is), resulting in a naturally low FODMAP product. Milk, regular yoghurt, cream and ice-cream can be made lactose free, and therefore low FODMAP, by adding lactase, an enzyme that separates the lactose into glucose and galactose. The dairy products that are suitable for the Low FODMAP Diet are ones that are lactose free and very low in lactose. The infographic below shows some examples of low FODMAP dairy options (and non-dairy, high calcium alternatives) that you can include on the Low FODMAP Diet. Dairy products are a rich source of many nutrients, and in particular, calcium. Research shows that Australians aren’t eating enough dairy which means they aren’t meeting their calcium requirements (1). Additionally, those following The Low FODMAP Diet may have even lower intakes of dairy and calcium (2). This is a concern because calcium is a key nutrient that plays a role in reducing the risk of developing bone related conditions such as osteoporosis. ​So it’s really important that we increase our intake. The Australian Dietary Guidelines recommend 2-3 serves of dairy products each day for most adults. NB. Rice and almond milk are not suitable for children or people who are struggling to maintain their weight due to inadequate content of protein and fat. If you’ve been avoiding dairy products on The Low FODMAP Diet because you thought you couldn’t have them, you’ll be pleased to know that this is not necessary. You can still enjoy lactose free dairy products. Actually, we encourage you to, because as a nation, we don’t eat enough dairy to meet our calcium needs. Geraldine Van Oord is a Monash University Trained IBS & FODMAP Dietitian. 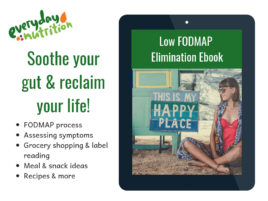 She runs a private practice in Wollongong NSW, predominately working with clients who suffer from IBS and other gut conditions who require a low FODMAP approach. For more information on Geraldine, you can visit her website: www.geraldinevanoord.com.au or you can follow her on Facebook: www.facebook.com/gvanoord.apd or Instagram: @ibsfodmapdietitian.